I looked at this and realized my pictures were horrible so I redid the photos with a huge price drop to make it more affordable. I have turned down offers at and slightly above the current price... But, I would rather it find a wonderful new home as I continue refocusing my collection! 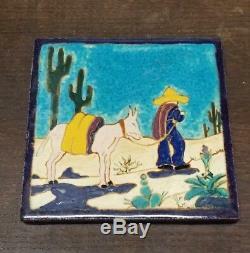 Brayton Laguna Pottery Tile in bright vibrant California colors featuring cacti and man in sombrero hiking. Brayton Laguna Pottery produced pottery in Laguna Beach, California from 1927 to 1968. They represent the American Art Pottery movement as it was embraced in California. The Tile measures approximately 6.75" x 6.75". It was backed in felt at some point, which is still attached, but loosened so you can see the clay. There is a small fleabite on the glaze edge. Also are two small spots of damage to the back of the tile, not noticeable from the display front. The larger measures about an inch long, second just a nick. The item "Brayton Laguna Pottery California Arts Crafts Tile Art Pottery" is in sale since Friday, January 25, 2019. This item is in the category "Pottery & Glass\Pottery & China\Art Pottery\California Pottery". The seller is "gigimgm" and is located in Mobile, Alabama. This item can be shipped to United States, Canada, United Kingdom, Denmark, Romania, Slovakia, Bulgaria, Czech republic, Finland, Hungary, Latvia, Lithuania, Malta, Estonia, Australia, Greece, Portugal, Cyprus, Slovenia, Japan, China, Sweden, South Korea, Indonesia, Taiwan, South africa, Thailand, Belgium, France, Hong Kong, Ireland, Netherlands, Poland, Spain, Italy, Germany, Austria, Bahamas, Israel, Mexico, New Zealand, Philippines, Singapore, Switzerland, Norway, Saudi arabia, Ukraine, United arab emirates, Qatar, Kuwait, Bahrain, Croatia, Malaysia, Brazil, Chile, Colombia, Costa rica, Panama, Trinidad and tobago, Guatemala, Honduras, Jamaica, Antigua and barbuda, Aruba, Belize, Dominica, Grenada, Saint kitts and nevis, Saint lucia, Montserrat, Turks and caicos islands, Barbados, Bangladesh, Bermuda, Brunei darussalam, Bolivia, Ecuador, Egypt, French guiana, Guernsey, Gibraltar, Guadeloupe, Iceland, Jersey, Jordan, Cambodia, Cayman islands, Liechtenstein, Sri lanka, Luxembourg, Monaco, Macao, Martinique, Maldives, Nicaragua, Oman, Peru, Pakistan, Paraguay, Reunion, Viet nam.